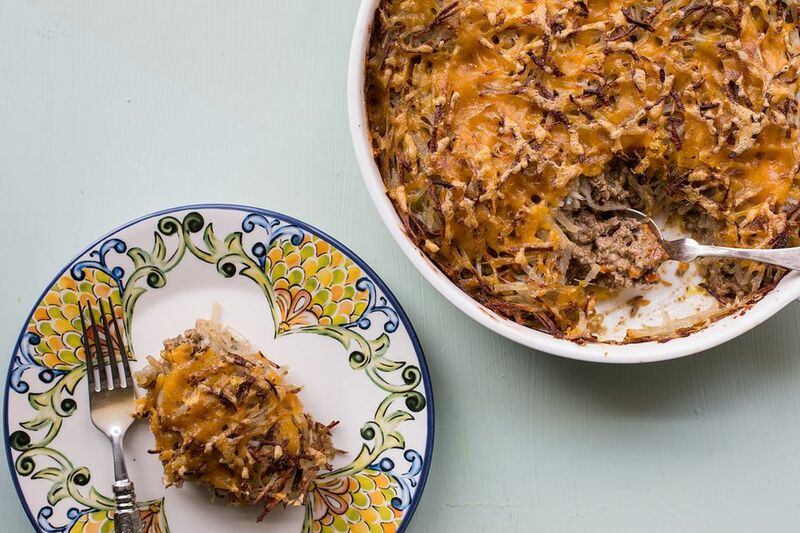 Some nights there is nothing better than a meat-and-potatoes meal, and this casserole combines both of those homey foods right into one dish. Crispy but tender shredded potatoes top a casserole of juicy ground beef bound together with a creamy cheesy sauce. It’s just the thing on a chilly evening, and a real family-pleaser. Leftovers will be fought over the next day. Make a great big green salad to go with this. Preheat the oven to 375 F. Lightly oil a shallow 2-quart baking dish or spray with nonstick cooking spray. Heat 1 tablespoon of olive oil in a large skillet over medium-high heat. Add the onions, carrots, and garlic and sauté for 4 minutes, until tender. Add the ground beef and sauté for about 8 minutes, stirring and breaking up the meat with a spoon, until all of the beef is brown. Turn it into a colander to drain, and return it to the pan. Season with salt and pepper and stir in the oregano, chicken broth, sour cream, and 1 cup of the shredded cheese. Simmer for 3 minutes, then turn the mixture into the prepared baking dish. Place the shredded potatoes in a clean dishtowel and twist and squeeze over the sink to remove as much water as possible from the potatoes. In a medium-sized bowl toss the shredded potatoes with the remaining tablespoon of oil, and season with salt and pepper. Evenly distribute the potatoes over the ground beef mixture. Bake for 30 minutes until the potatoes are tender and browned on top. Sprinkle the remaining cup of shredded cheese on top of the potatoes and return the casserole to the oven for 5 minutes, until the cheese has melted. Serve hot. What the Kids Can Do: Measure the various ingredients. You can also suggest your kids pick an herb or spice other than oregano to change things up (think about thyme, marjoram, basil, or chili powder), spread the potatoes over the casserole, sprinkle on the cheese at the end.